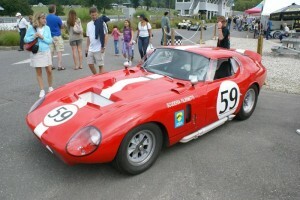 Chassis # CSX2602 was the fifth Shelby Daytona Cobra Coupe completed in Europe by the Carrozzeria Gransport for Shelby American and Ford Racing. It competed in 6 races in the 1965 Season at Daytona,Sebring,Monza,Spa,Nurburgring and finally at Le Mans. However there was a bit of a twist to the formal entry situation. 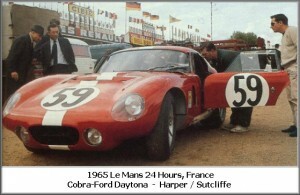 This Cobra Coupe was painted in the red and white team colors of Scuderia Filipenetti for Le Mans. 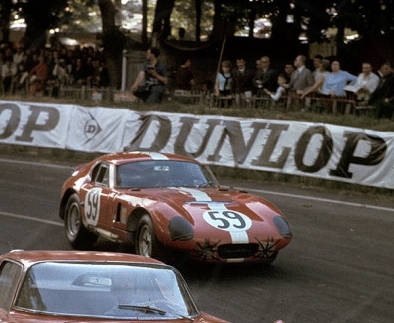 Ford and Shelby had used up all of their allotted entries for the 1965 Race and asked the Switzerland Team of Georges Filipenetti,who usually ran Ferraris,to race a Cobra Coupe and enter it separately for the French Championship Race. 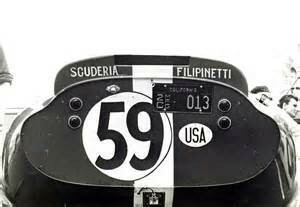 They did and ran it for just that once in the red with single white stripe livery as #59.Peter Sutcliffe and Peter Harper were the team drivers for the Filipenetti/Ford. They ran very solid and challenged up front for a bit,but retired in the 10th hour with a blown engine. 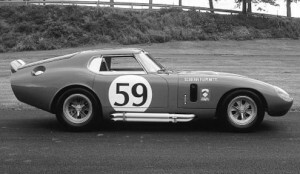 After the Le Mans race, the Cobra Coupe went to Alan Mann Racing in England and was repainted in the more familiar and well known Shelby American Team Colors of Guardsman Blue with the twin White stripes and was never “officially” raced again. 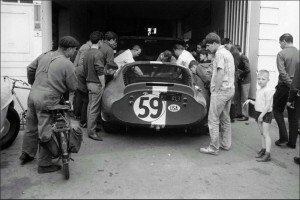 This is just an interesting side note to the Championship Years 50th Anniversary of 1965 which will now be brought up some more as the 2015 Le Mans 24 Hour race draws nearer in June of this year. 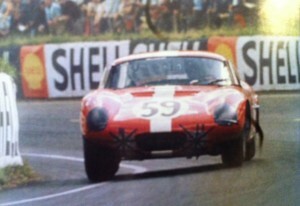 This is definitely our Favorite liveried Cobra Coupe as being the “One Off” for the Le Mans ’65 even though it did not finish. 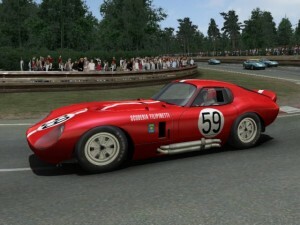 Once in a while you will see one of the replica coupes in red but not very often here in the US. 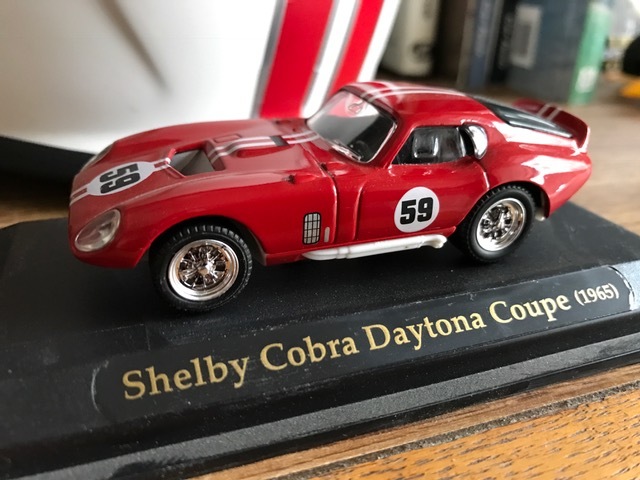 For awhile I have toyed with building one of the replica kits from either Superormance or Factory 5 as probably 90% of the “Kit” coupes seem to be done in the blues…..
Short but very precise information… Appreciate your sharing thjs one. the internet users, its really really good piece of writing on building up new blog. all web owners and bloggers made excellent content as you probably did, the internet will likely be much more useful than ever before. Very great post. I just stumbled upon your weblog and wanted to mention that I have really enjoyed surfing around your blog posts. I like this weblog very much, Its a really nice office to read and obtain information. “Nunc scio quit sit amor.” by Virgil. Hey very cool website!! Man .. Excellent .. Wonderful .. I’ll bookmark your website and take the feeds also…I’m satisfied to seek out so many helpful information here in the put up, we need work out more techniques in this regard, thanks for sharing. Our platform is just one of the downloadable platform themes offered by WordPress. Back when we were renomusclecars.com we had an “in house” designed site but have found it is much easier with the wordpress setup and you can experiment with their other offered themes while the site stays active………. I’m experiencing some minor security issues with my latet website and I’d like to find something more safeguarded. definitely you’re going to a famous blogger if you happen to are not already. I try and do a few updates every couple of weeks. Had not had the chance recently but right before your comment was sent I had just finished putting new post on the “Sports Cars and All That Jazz” event from here in Reno.